There’s an episode of Modern Family where both Gloria’s eyesight, and Jay’s hearing is getting worse. FYI, incase you don’t watch the show, Jay and Gloria are married. He’s considerably older than his younger, very hot wife. Both of them are in denial about their problems and in typical sit-com fashion when things finally get resolved, and Gloria’s wearing her glasses, she looks at Jay and realises that he does indeed look a lot older than she thought. I too have to wear glasses for reading. 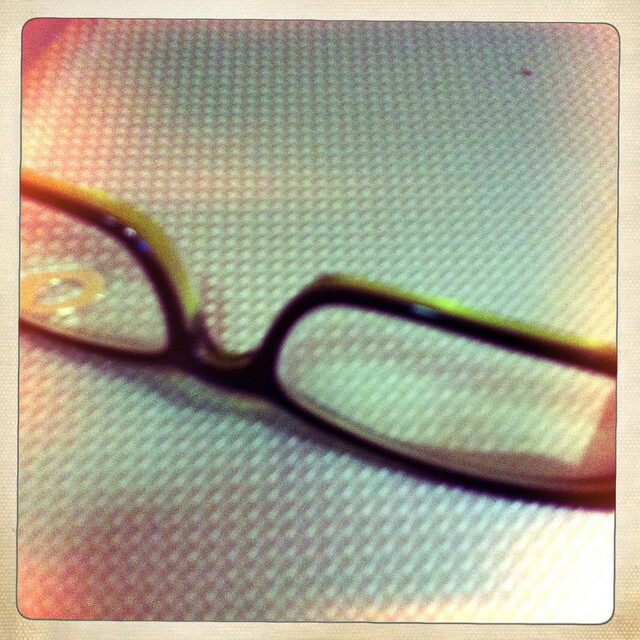 In fact everything’s now a blur when I don’t wear them. However, when I looki in the bathroom mirror I think I’m doing all right for my age. Sure, there are some wrinkles and lines there but it’s not too bad. That is, until I put my glasses on and I can see everything in clear focus and realise there are quite a few more wrinkles and lines than I originally thought. Pity I can’t keep my glasses on when I pluck my eyebrows. I can’t see what I’m supposed to be plucking when I don’t have my glasses on but can’t pluck with the glasses on. I’m sure I could employ some sort of magnifying glass but don’t know that I’m ready for that because of the other hair on my face that will show up if I stray from the eyebrow area. I had my glasses on the other day when I went to the loo at work and took a peek at myself after washing my hands. As soon as I got home that evening I madly plucked my eyebrows. Maybe I should start getting someone to do it for me? Hmmm, wonder if the lad would be up for it? I’ve become a woman from a Grumpy Old Women episode where they discuss their diminishing eyesight. One woman says she has multiple glasses scattered around her home but can she find them when she needs them? No, of course not. I have three pairs of glasses I use constantly. One pair in my bedroom, one pair near the computer and one pair in my handbag for work and to read the small labels on packets of food at the supermarket. I have a fourth pair just in case thanks to the buy two get one free thing some optometrists have. I have to remember to take glasses out with me if I use a different handbag so I can read menus or whatever else requires it. One day I got to work and didn’t have any glasses with me. Luckily I was able to duck out to a chemist to buy some of those magnifying spectacles. They gave me a bit of a headache but at least I could read. Big fonts are my friend. Small fonts are the bane of my life. I’ve mentioned the tiny print on many labels. Small website fonts are another annoyance. Luckily, many recent website updates have embraced larger font sizes. And I know I can increase the font size myself if I want – and I do that a lot. Ctrl+ for Windows or Cmd+ for a Mac are my keyboard go tos to increase font sizes. Even looking at my jewellery – particularly earrings – I sometimes have to put my glasses on so I can see exactly what I’ve got. I find that wearing my glasses when preparing food is pretty much a given now and I’m guessing that in the not too distant future I may have to embrace the bi-focals, although my long distance vision is still good. I wonder if I’ll ever lose that frustration that I get when I try to read something without glasses and realise that no matter how far away from my eyes I put it, it will never be in focus? What about you? Do you have to wear glasses for reading?